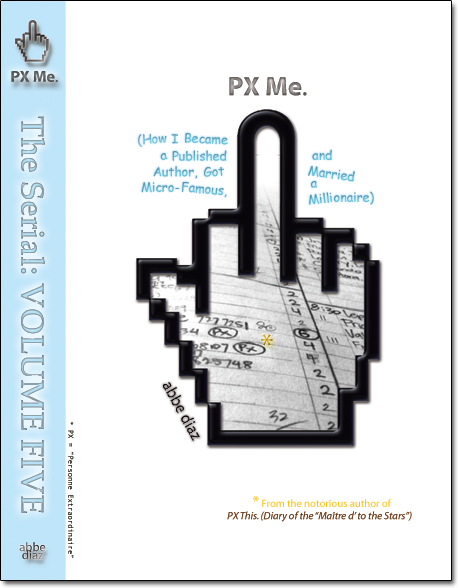 ** Volume Five has been REMOVED from Amazon due to the release of PX Me in its entirety. To receive PX Me FREE, please e-mail PX This (at px.this@gmail.com) with proof-of-purchase of any of its serial volumes. "Your story is about ethical breaches endemic to some of the highest ranking names at the most-read news sites in one of the most mediacentric cities in the world — and the media isn't going to touch it." Abbe Diaz rubs elbows with Billy Joel and Puff Daddy. Leonardo DiCaprio, Jeremy Piven, Harvey Weinstein, Brian Grazer, Mike Tyson, etc etc all sweat her. She's a best-selling author and the former "maitre d' to the stars." She's married to a multimillionaire. Then why is the media trying so hard to squelch her latest book? • The New York Post, New York magazine, Gawker, The Huffington Post, and Eater have all published misinformation and/or engaged in other unethical deeds of varying degrees on multiple accounts about Diaz, her work, and even her husband’s businesses. • Mounting evidence also gravely suggests that in 2004, the (then) foremost New York Times restaurant columnist, the head editor of Gawker, and a New York Times photographer colluded to misappropriate the nonfictional story in Diaz's first memoir in an apparent attempt to garner a "book deal" and/or "screen option" for themselves. • Diaz has gone so far as to offer up to $10,000.00 for any established professional journalist to debunk her dire allegations against The New York Times and Gawker. • Gawker owner Nick Denton forbade any writers from accepting her investigative-reportage challenge, under threat of termination and/or blacklist. • Some of the most prominent names in the media have explicitly evaded Diaz's monetary offer for an objective investigative account and her assertions of blatant journalistic transgressions. WATCH the trailer for PX Me. Serials are stories published in installments or "episodes." Serials have a long history, dating back as early as the 17th century. Charles Dickens is credited with popularizing the serialized novel with A Tale of Two Cities. Reputedly, New Yorkers would gather at the harbor docks to await incoming ships and ask disembarking passengers for updates on Dickens’s narratives. Lately, serials have enjoyed a resurgence, enlivened by the functionality of the Web, eBooks, and mobile devices. How long do I have to wait for the next volume to be available? How much is this going to cost me? 99 cents per volume. There will be 10 volumes total, so if you read PX Me all the way to the end, that’s a total cost of $9.90. Wait, you haven’t answered my question. Plus I have other comments and/or a suggestion or whatever. Can I contact you directly? PX This has been lauded as “the bible of the [NYC] industry,” and its author, Abbe Diaz, has been featured in various media outlets such as The New York Daily News, The New York Post, msn.com, The Morning Show (Australia), CBS’s The Insider, The New York Observer, Blackbook, Time Out New York, Perez Hilton, Gawker, LXTV-NBC, NBC Chicago, New York magazine, Mediabistro, hamptons.com, and foodchannel.com, just to name a few.